With no local data residing on end-users’ devices and few changes to the IT infrastructure, it’s an attractive, secure, enterprise mobility solution. eMazzanti Technologies, A NYC area IT consultant and MSP, today announced a comprehensive solution to simplify enterprise mobility without disrupting the way companies currently run their IT. The solution is based on Microsoft Azure cloud technology and the browser-based unified workspace solution from Awingu. eMazzanti’s offering aggregates all company files and applications to one secure online workspace that can be accessed from any device, OS or browser. eMazzanti’s comprehensive IT security, managed services and 24/7 proactive support make the solution especially attractive to small and mid-size businesses. Awingu is a unified workspace that offers a highly secure and audited access to company files and legacy, web and SaaS applications in a browser-based workspace, accessible via any browser, on any device. It offers a very intuitive user interface, a mobile app for tablets and expanded administration tools for greater control and auditing. Awingu delivers IT services securely and efficiently. Users work and collaborate from an online unified workspace and can access any application, anywhere. It leverages the latest web technology and works with any cloud service or infrastructure. No agent installation is required on personal or corporate devices. Users only need an HTML5 browser-capable device and an internet connection. Businesses are empowered to mobilize all company applications without making changes to existing software or backend infrastructure. Awingu connects to applications independent of where they run, whether SaaS (e.g. Office 365) or legacy applications such as AS400. 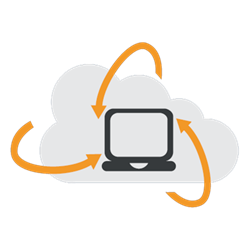 The Awingu unified workspace solution simplifies file and app sharing. Sending a URL allows user access and real-time editing. No plug-in is required on the end-user device for hassle-free collaboration. No data footprint is left, and all confidential files remain safe and secure on premise or in the cloud. Awingu is also a safe and simple way to implement BYOD. It is SSL-encrypted, offers two-factor authentication and is auditable. All IT assets remain centrally managed and secure, and no agent installation is required on personal or corporate devices. Awingu is a unified, browser-based workspace. It empowers users to work and collaborate from virtually anywhere using any HTML5 browser-capable device. As a turnkey, cloud-based solution, Awingu brings the ease and convenience of platform agnostic mobility to the enterprise and delivers everything needed — legacy and cloud apps, documents, and data — to stay productive. It requires zero configuration and zero client software installation, making IT administration a breeze. Awingu is headquartered in Ghent, Belgium with offices in the US.